Remember this room? This is bedroom number two. It could be another master suite with its large closet and en suite bath. It sits at the very front of the house and gets the most beautiful natural light through its four windows! There's also an additional fireplace that's been covered. We've chosen not to start any major demo on the walls or bathroom yet, so it remains behind the sheet rock for now. A few weeks ago I decided to go antiquing on a whim. A favorite past time of mine. :) I came across the most beautiful vintage iron bed for only fifty bucks! Score! It was exactly what I had in mind for this room, but I'd never been able to find one at the right price. I guess it was my lucky day! When we first moved into the farmhouse we had Baker's nursery temporarily set up in this room. And by "temporarily set up" I mean he had a crib and changing table surrounded by piles of boxes and other random things. And we nailed up some cheap black-out curtains from Walmart over the windows. Yes - nailed. It wasn't pretty. But, we transformed one of the upstairs bedrooms into a really cool nursery and once we moved Baker in I was able to slowly clear out the room and get a clean-slate vision for the space. We wanted to make the room feel both comfortable and inviting for our guests by incorporating soft, casual textures and authentic farmhouse style. We were able to complete the room on a tight budget, as well, by recycling pieces we already owned and scouting out the local trade pages. I found a beautiful antique armoire for only $85 and the bed linens were purchased from Ikea and Target. We also made our own curtain rods and hardware and used drop cloths as curtains. All very accessible and affordable if you're feeling inspired! The iron bed was missing a pole right in the middle of the headboard. I used a garland from Hobby Lobby ($7) and a wreath from the Dollar Spot at Target ($3) to make this little guy to take up the space. The bench against the wall was actually from the old barn on the back of the property! No idea how old it is, but it's definitely "vintage" :) We made the curtain rods by using 10 ft. poplar closet poles ($16) and wooden finials ($2) from Lowes. The curtains are made from 4 ft X 12 ft drop clothes from a local hardware store. They were only $7.99! I just cut them to length and folded the top over to create the ruffle. No sew! A beautiful aerial photograph of the farm and a very special sketch of the farmhouse. Our friends might recognize this old door. We used it as a headboard in our last home. It looks completely different styled in this room! A closer shot of the drop cloth curtains and some vintage goodies.. Antique paddle boards from the fire station Brett works at! They sort of move around the house, but they've settled in this new room for now. Of course Daddy's little shadow wanted to help! Hope you enjoyed the tour. We're really looking forward to Spring weather and friendly visits! Chandelier - original???? I am in heaven!!!! Yes, it's original! And thank you so much! Tara, thank you so much! So happy to have you. I appreciate the comment! I adore this room! Which bed skirt is that from Target? Is it white or cream? So super beautiful! Thank you! It's white! It's from the Shabby Chic bedding line at Target. The one in this room is called the "Shabby Chic Snow White Bed Skirt"... Here is the direct link! Thanks! I love the mix off whites and creams and tans in this room! It's a soft white! Definitely not cream! You're not being a pest! Unfortunately, I have no idea which sheets in particular these were. I bought them in the store a few years ago and literally just walked around and played with materials until I found the ones that matched the best! Hi! Super glad I found this post as I've been struggling with how I wanted to decorate my spare bedroom! For your curtains, what kind of hooks are you using? Looks almost like clothespins or are there holes in your curtains? Thanks for the quick reply, that was a simple find - already ordered :) Beautiful home & family! Love, love, love this room! When u say you made your curtain rods...how exactly did you do that?! Do you mind sharing? The room is beautiful! May I ask where you bought the rug? I just found your site and your home is so cute! I know you said all of the bedding but the skirt is from Ikea. I was looking online for the solid, tan color pillows (with the ties and the cute little stripe on the inside). I could not find them on Ikea's site. Perhaps you bought them a long time ago? Thanks for any info you can offer. Hi, Cathy! Thank you! I purchased everything in early 2015. I know those large euro shams are the "Ursula" pillow cover but I'm not sure if that color is still available. Thanks so much for the help. They are only available in grey online at Ikea, but I just bought a pair of beige covers on Ebay--yay! You're so welcome! I'm glad you found some you like! Thank you! It's from Ikea! Thank you so much! Hope you get some awesome finds. My thrift scores are usually my faves!! hi, what paint color did you use? 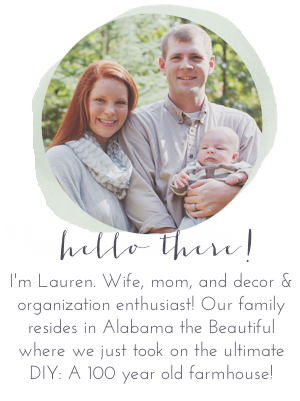 I use Valspar's Woodlawn Bedroom White throughout my home!